Used in large industries for heavy operations, power presses can be powered by hydraulic, pneumatic or mechanical means. However, hydraulic, or fluid pressure, powered power presses are the most common type due to their high efficiency and availability in a wide range of styles, sizes and capabilities. Some examples of power press styles include frame styles, such as H-frame, C-frame or four post style. 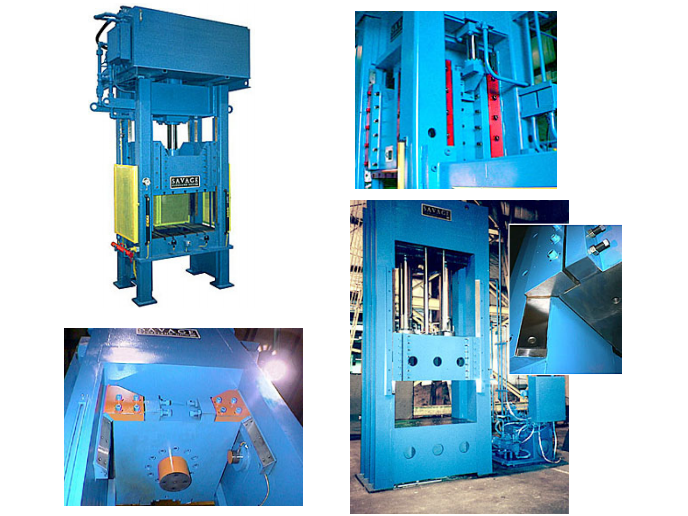 Power Presses – Savage Engineering & Sales, Inc.
Industrial manufacturing, for use in the assembly of various products and is particularly useful in sheet metal fabrications. Automotive, for use in the assembly of structural components as well as internal metal parts; aerospace, to be utilized in the production of components and assemblies such as flight hardware and ground support equipment. Medical, for the fabrication of medical equipment and devices such as prosthetics and surgical tools; and construction, in order to manufacture industrial warehouse components such as safety rails, floor gratings and more. Metalworking takes place by putting stock on a bottom die and striking it with a top die, which is attached to a crankshaft with connecting rods. Rotation of the crankshaft is accomplished from a motor, flywheel, and gear power transmission. The two primary types of power presses, based on their clutch type, include full revolution (mechanical clutch) and part-revolution clutch. A full revolution clutch is a type of clutch that, when tripped, cannot be disengaged until the crankshaft has almost completed a full revolution and the press slides a full stroke. Power presses with this type of clutch were designed to make one full machine stroke or crankshaft revolution after each engagement of the mechanical pin, collar, or rolling key. A part revolution clutch, in contrast, can be disengaged at any point before the crankshaft has completed a full revolution and the press slide has completed a full stroke. Most power presses with part revolution clutches are air clutch and brake. After trapping air in a chamber or tube, the compressed air causes the clutch to engage and the brake is disengaged; the press then makes a single stroke. Power Presses Power presses are used to shear, punch, form, or assemble metals or other materials by using tools or dies attached to slides or rams.